With summer holiday season fully underway, the first of August's Thursday evening Salt Ayre time trials saw a reduced field - just 42 riders in all; 7 at 2 miles, 12 at 6 miles, & 23 at 10 miles. Over 2 miles fastest boy was Luke Oakes in 6:23, & fastest girl Kirsty Maher in 7:01. At 6 miles James McCracken was fastest boy in 17:01, & Tilly Percy fastest girl in 17:45. And at 10 miles Andrew Horn was fastest man in 22:14, with fastest woman (& 2nd overall) Lynn Hamel in 22:38. Thanks to everyone who helped out on the night, & to Clarkson Hirst Solicitors for sponsoring the series. The full results are below. Congratulations to Tom Brook who stormed to a convincing win in last night's Jungle Cafe Hilly Time Trial, event 6 in the Inter Club Series. Another familiar face, George Wharton of Salt Ayre Cog Set & Kent Valley, was 45 seconds back in second place, and Duncan Orme a further 40 seconds back in 3rd. 4th was Series Organiser Andrew Barlow in 31.57, & 5th Ian Sibbert in 32.29. Other than Tom, the only other LCC rider was Dave Harwood in 38.16. With just two more events to go, Kent Valley have a commanding - and what looks like an unassailable - lead. A steep climb rising 160m in 1.2 miles. Starting on a gentle rise situated north of Ulverston on Old Hall Road (B521) adjacent to Stone Briggs Farm (the Alpaca farm after Old Hall Farm). The course then turns left at the crossroads with Eller Riggs Brow and passes the Chiltern Seed Farm. The riders go through a narrow part between buildings and must obey marshals instructions. The next section is extremely steep and narrow up to farm buildings. The road levels for a short time before another kick to Knottallow Tarn (local fishing spot) then a lumpy rollercoaster to the finish situated before the T junction. Starting adjacent to Stone Briggs Farm (the Alpaca Farm) on Old Hall Road (B521) just north of Ulverston. Grid reference 281802, SATNAV- LA12 7PE. Parking is available along the verge of Old Hall Road for a few cars and (depending on the anglers) parking near the top of the course by Knottallow Tarn. Locals are requested to park in/near the Gill and ride up to the start. Riders must take care in the narrows and especially where it becomes very steep. If riders wish to get back to the start whilst racing is underway they will be directed in a short loop rather than back down the course. The course record of 6 mins 30 secs is three years old & held by Dave Ralph of Lakes RC. Could it go on Monday? The next event in this season's Inter Club Hilly Time Trial Series - the 6th of 8 - is Kent Valley's Jungle Cafe Hilly Time Trial on Monday, 3rd August. The first rider is off at 7pm, & last sign-on is 6:50pm. The course details: Start at Approx 100 yards North of Mint Bridge, Shap Road, Kendal on the A6 road and proceed on the A6 to turn at the Jungle , Selside. Turn and retrace to finish on Mint Bridge Approx 100 yards South of the start. There is parking near the start, postcode LA9 6SB. So we could do with getting a few riders up there! It was cool & blustery for the last of July's Thursday evening time trials, with the start of the school summer holidays seeing fewer riders taking to the track - 58 all up (8 at 2 miles, 22 at 6 miles, & 28 at 10 miles). It was a close-fought battle for top-spot among the two-milers, with Luke Oakes edging out Jack Tipler by just two seconds, recording a fine 6 mins & 13 seconds. Ethan Yates was 3rd in 6:36 & Jack Malin 4th in 6:55. The final places were rounded out by two sets of siblings; Louis & Ella Cornwall in 7:37 & 7:53 respectively, & Jasper & Arlo Cummins in 8:54 & 10:04 respectively. It was another tight tussle at the top of the six-mile leader board; Nigel Edwards in 16:31 from Bailey Johnson in 16:41, Hannah Edwards in 16:51, & Isaac Atkinson in 16:59. After Jake Edwards in 17:58 came the 2nd & 3rd girls, Flo Horton in 18:57 & Nancye Roberts in 19:16. We had a tandem, a trike & a two-up out on the track last night too. I'm not sure how it feels taking a tandem around the corners on Salt Ayre, but the pair of Ian Richardson as pilot & Kelli Hirst as stoker looked to be coping fine, & recorded 26:12. Despite a couple of weeks off the trike, Jim Lawley nevertheless recorded a very respectable 35:00. And Mary Neil & Karen Gay are obviously enjoying the 2-up partnership they've struck in recent weeks, completing the 12.5 laps in 31:13. Of the solo two-wheelers at 10 miles Andrew Horn was half-a-minute quicker than Ian Sibbert, recording 22:09 as against 22:39. Then in a role-reversal to last week Dad Andrew had the beating of son Ben Barlow, their times 23:12 & 23:18 respectively. Not that he needs any, Ben's 'excuse' was the start of the school holidays have seen an increase in his training load! Meanwhile it was very close between the women, with Jenny Evans just one second faster than Ali Oldham, in 27:05 as against 27:06. Thanks very much to the big team of happy helpers who made the racing possible, & to Clarkson Hirst for supporting the series. I'd be very glad to teach anyone who wants to how to get time trial results up on this website each week, but otherwise there'll be no racing updates during August, until I'm back from holidays at the start of September. As ever, just click on 'Read more' below to get the table containing full results. Another 'not bad if not particularly good' week at Salt Ayre, from a performance-perspective, with a bunch of Personal Bests coming more through stronger mid-season form than through especially conducive conditions. But it was dry & mild, albeit blustery. And as usual there was a super turn-out, with 73 rides all up (11 at 2 miles, 32 at 6 miles & 30 at 10 miles). Over 2 miles Graeme Cook was fastest, in 5:23, ahead of Jake Edwards in 5:58. Girls took the next 3 places - Megan Howarth was 3rd in 6:51, Kirsty Maher 4th in 6:56, & Anya Bardsley 5th in 7:12. At 6 miles the top 3 all cracked 16 minutes - Bobby Horton was first in 15:03, Evan Busby 2nd in 15:41, & Ben Pennance 3rd in 15:54. The first 3 ladies were Hannah Edwards in 16:58, Alice Earnshaw in 19:27, & Esther Wong in 19:28. At 10 miles just one rider went under 22 minutes, Andrew Horn in 21:58. 2nd was Ian Rutherford in 22:37, & 3rd Mark Monkhouse in 22:42. The only other riders to average over 25 miles/hour were the two Barlows - son Ben 14 seconds quicker than Dad Andrew, in 22:55 against 23:09. The first three women were Kerry Oldfield (27:57), Sue Holden (29:35), & Mary Neil (30:27). As always thanks to the team of volunteers who did their stints on the night, & to Clarkson Hirst Solicitors for their support. Please click below for the full results. Some of you will know, but others might not, that our current Mayor of Lancaster, Jon Barry, is a keen cyclist, 2nd-claim member of Lancaster CC, & a regular participant in Thursday evening time trials. On 22nd August Jon is cycling the newly opened Morecambe Bay Cycle Way to raise money for one of his chosen charities during his year as Mayor, St John's Hospice. If you want to support his ride you can join Jon for the full 80 miles from Barrow-in-Furness, for 40 miles from Grange-over-Sands, or for the final 5 miles from Lancaster's Millennium Bridge to Glasson Dock. Or if you can't join his ride, you can sponsor Jon or any other rider. More impressive than the fact that Jon is doing this ride, he'll be pulling his specially-made Mayoral bike-trailer along much of the route, which'll make the challenge tougher-still! For more information about Jon's ride & how to get involved, go here. It was a warm & windy evening for the 20th of this season's Thursday Salt Ayre Time Trials, sponsored by Clarkson Hirst Solicitors. Although it didn't feel like a quick night, there seemed to be a fair few personal bests recorded, so for some at least it was faster than it felt! The fastest of the 19 riders over two miles was Jack Tipler in 6:02, closely followed by Dylan Edwards in 6:06 & Ethan Yates in 6:17. Megan Howarth was the fastest girl, in 6:54, from Kirsty Maher in 7:14 & Amelie Earnshaw in 7:37. 25 riders undertook the six mile time trial, with George Mason the fastest in 14:49 from Bobby Horton in 15:27 & Ben Pennance in 15:58. Of the girls, Flo Horton was fastest in 19:34, ten seconds ahead of Nancye Roberts in 19:44, and 3rd place Emilia Wood close behind in 19:49. The top 4 of the 32 riders tackling ten miles were very close. Lynn Hamel was fastest in 22:50, then joint second were Mark Monkhouse & Ian Sibbert in 22:55, and just three seconds further back was Tom Phillips, in 22:58. 2nd placed woman was Jenny Evans in 27:16, and 3rd Kerry Oldfield in 27:35. The last riders off were the two-up duo of Karen Gay and Mary Neil, perhaps demonstrating that practice & experience are pretty useful in riding bit-and-bit twelve-and-a-half times around the track, as they went a full minute & 25 seconds faster than last week, recording 30:21. Twenty weeks in, and people such as Bob & Jan Muir, and Tom & Carmen Jackson are down at Salt Ayre all evening every Thursday; they're there before you arrive & after you've left, getting everything ready & tidying it all away again afterwards. Of course many others help too, but it's people such as Bob, Jan, Tom & Carmen who keep our cycling - & cycling in general - going. So please be sure to let them know you appreciate their efforts. It was great to see a fair few Cog Setters helping out last night too, & looking like they were enjoying themselves! Thanks to them for mucking in with everybody else. 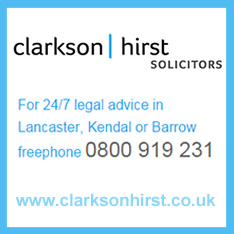 And finally, thanks to Clarkson Hirst Solicitors, who are supporting this year's time trialling with a generous prize fund. As always, click below to get the full results. This week's Thursday evening time trials produced a crop of excellent times. At two miles, Isaac Atkinson & Adam Hodgson both recorded 5 mins 29 seconds. Third was Luke Oakes in 6:07, just beating Jack Tipler by two seconds. Fastest girl was Ella Cornwall in 7:47. At six miles a very much in-form Ben Barlow stormed around the 7.5 laps to produce the fastest time of 2015 so far, 13:34. Second was Ben Pennance in 16:16, and third Graeme Cook in 16:32. Fastest girl was Sasha Oldham in 18:11. At ten miles, Ian Sibbert was quickest by more than a minute, in 22:36. Tom Oldham was second in 23:41. Steve Hodgson was third, a minute & a second further back, in 24:42. Fastest woman was Louise Goddard, in 28:08. Salt Ayre Cog Set Chair Mary Neil combined with Karen Gay for a 2-up time trial, the duo riding 12.5 laps at a consistent pace to finish in 31:46. Thank you very much to everyone who came along to help on the night, old-hands and new-ones alike. The full results are below.